With more than 150 million people in the United States (nearly half of the population) requiring some form of corrective eyewear to compensate for visual impairment, chances are you have had your eyesight graded on the 20/20 scale before. If you haven't, you have probably heard other people saying they have "20/20 vision" or even the phrase "hindsight is 20/20." The vision scale is so prevalent in American culture that there's even a TV news show named after it. So imagine my surprise when I was told during my first Australian eye exam that I had 6/6 vision with my corrective lenses. Turns out, the 20/20 scale isn't universal. So what exactly are eye doctors measuring, and how can the scale be different in different parts of the world? After examining a large number of people, American ophthalmologists decided on the 20/20 scale, saying that "20/20" is the normal visual acuity of the average person. What that means is that standing 20 feet away from something, you can see what the average person can see standing 20 feet away from the same thing. Take the Snellen eye chart, which is what your eye doctor will usually use to judge your eyesight. The Snellen chart is the one that's topped with the big E and consists of 11 rows of capital letters that get progressively smaller toward the bottom of the chart. You will be placed 20 feet away from the chart (most doctors' offices are too small for this, so mirrors will often be used to simulate 20 feet). The doctor will ask you to read out the smallest line of letters that you can see from 20 feet away. Most people can read the fourth line up from the bottom without any trouble, so if you can do this, your vision is considered 20/20. Now, obviously most places in the world don't use the Imperial system to measure distance, they use the Metric system, which is where the 6/6 scale comes in. In this case, doctors are not measuring how well you can see something from 20 feet away, they are measuring how well you can see at 6 meters away (that is, 19.69 feet approximately). It's the same principle, just a slightly different measurement. Of course, many people will have worse or even better than 20/20 vision. These people will tip the scales a bit. Back to the Snellen chart, if you can only see the big E up top and none of the other lines of text, you are considered to have 20/200 vision. That means you see at 20 feet what the average person can see at 200 feet away. So, if you take someone with 20/20 vision and put them 200 feet away from the chart, they would still be able to see the big E clearly. 20/200 visual acuity and worse is considered legally blind in the United States. That means that if you have 20/200 vision even with the best correction in your better eye, you are considered legally blind. Alternatively, if you can read the tiny bottom line of text on the chart at 20 feet away, you have 20/5 visual acuity, which means you can see at 20 feet that which most people can only see at 5 feet away. Again, take that person with 20/20 vision and put them 5 feet away instead of 20, and they would finally be able to see that last line of text. Most humans actually don't have the ability to have much better than 20/10 vision, with 20/5 vision reserved for animals like birds of prey. These numbers would obviously be adjusted for the 6/6 scale. That said, your 20/20 or 6/6 visual acuity is not a measure of your prescription as it does not take into account the nature of the problem, only the result of it. 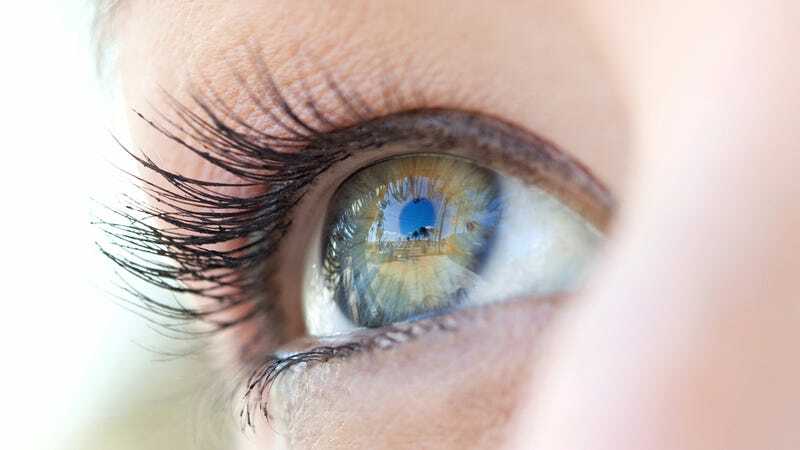 That's why you can't just pop in to your ophthalmologist, read the Snellen chart, and head out—they have to measure things like peripheral vision, colour perception, depth perception, and eye fluid pressure, among other things. Will Sitting Close to the TV Damage Your Eyes? What Causes Red-eye in Photographs? Will Reading in Dim Light Damage Your Eyes? The Snellen eye chart was created by Herman Snellen, a Dutch eye doctor, in the 1860s. There have been other charts developed, however, which also might be used during an eye exam. An example is the Tumbling E chart which features capital letter E's facing in different directions. This chart comes in handy when young children who don't know the alphabet are being tested, or for people who don't know the English alphabet. Rather than say a letter, they can pick the smallest line of E's that they can see, and say or point which way the "arms" of the E in that line are facing. Numerous studies have shown that this chart and the Snellen chart come up with nearly the same results. Around 1 million people aged 40 and older in the United States are considered legally blind. To obtain a driver's license in the US, you need to have at least 20/40 vision or better. If you can read the fifth line of text on the Snellen chart from 20 feet away, you are considered to have 20/40 vision. Around 2.5 eye injuries occur every year in the United States, resulting in 5,000 people permanently losing at least part of their vision. Men aged 18-45 are the most likely to have an eye injury occur (over 70% of all eye injuries occur in males). Cataracts, the clouding of the lens inside the eye which leads to decreased vision, affects 22 million Americans aged 40 and older. Around half of Americans have suffered from cataracts by age 80. The medical costs relating to cataract treatment nationwide is estimated at $6.8 billion every year. For colour blindness, red-green defects are the most common, and those of Northern European descent are the most likely to suffer from it. Red-green colour blindness is much less prevalent in other studied populations. Around 8 percent of men and .5 percent of women in Northern European populations have this colour blindness.